Congratulations to the nine Wellington players among the twenty-four chosen to play against the United States later in the year. Newcomers to the ranks of Senior representative are Kath and Kaye Alison, Fay Doyle, Helene Hay, Shirley Hayes and Catherine Maher. The team is very much a family affair with eight couples and two sisters. Forty-five teams from around the North Island took part in the Hawke's Bay Summer Doubles. Bay View clubmates Sharon Cannon and Murray Porter teamed up to defeat Ian Hay and John Maxwell in the Trophy final. The AGM Agenda has been issued. The first "away" defence in the competition's history saw Khandallah convincingly beat Kapiti. Khandallah's next defence is away to Masterton. Women: Kath Alison (Kapiti), Diane Findlay (Christchurch), Margaret Maher (Northcote), Joan Miller (Masterton), Sue Neilson (Rotorua), Jean Parley (Stanley Bay). Men: Kaye Alison (Kapiti), Bob Bridge (Stanley Bay), Andrew Findlay (Christchurch), Rex Hayes (Kapiti), Trevor Neilson (Rotorua), Malcolm Pfhalert (Christchurch). 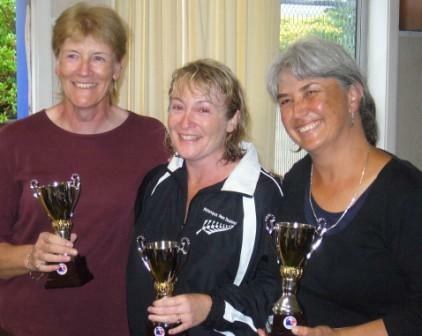 Jane Gilbert (Rotorua), Jayne Heron (Cockle Bay) and Laurel Priestley (Herne Bay) won the inaugural National Women's Triples at Park Avenue. In second place was Joan Miller (Masterton), Susan Norman (Windy Hills) and Claire Wilson (Masterton). Note: The format is a round-robin with points differential separating the teams on the same number of wins. Claire Bradburn (Silverstream) is the new WPA President. Owen Davie (Silverstream) will be the new Secretary - contact details to follow. Brian Smith (Khandallah) remains as Treasurer. Maurice Belz, Sebastien Merval, and Lee Tafford won the eleventh edition of the WBS Triples. In the final they defeated Andrew Joe, Graeme Morris, and Dean Norman.